If you enjoy swimming on holiday and do not need complete privacy then you may be interested in a cottage which is part of a cottage complex or holiday park with communal swimming facilities. A great number of cottage complexes have shared pools where you can enjoy splashing around with others. The swimming pools are usually much bigger than one would find for private use. Cottage complexes also tend to have other facilities that you may like to make use of such as games rooms. For this reason and because of better value, self catering cottage complexes can be a good option for young families. Holiday parks are sometimes thought of as low budget holiday accommodation which is simply not the case. There are a number of amazing luxurious holiday parks that feature 5 star self-catering breaks. These have designer décor and hand-made kitchens plus a range of high quality appliances and furnishings. The leisure facilities tend to be equally high class. The variety of accommodation and settings for holiday parks is truly diverse. The holiday accommodation could be pine lodges, apartments, villas or cottages. These are found all over the UK and Ireland, all will have that essential swimming pool and a host of related leisure facilities that keep children occupied and active on holiday. 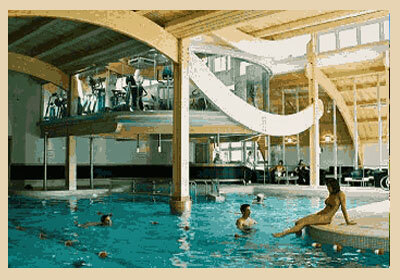 Adults also enjoy 'playing' in a swimming pool. It is nice to get the chance to mess about or even show off.